Since the last post on Hurricane Wilma, I was sent an interesting article taken from the Economist on the link between global warming and hurricane strength and frequency. The oft quoted link is between rising sea water temperatures and hurricane frequency. The reason being that ocean surface temperatures have to be above 26 degrees for hurricanes to form. However, analysing the surface temperature around the world and the hurricane frequency increases it turns out the while surface temperatures in the six ocean basins have increased since the 1970s, only in the North Atlantic did both the number and length of hurricanes increase. Anyway, another piece of interesting but inconclusive evidence. Reading a little more about Wilma, I found that though this is the strongest Hurricane ever recorded, it only comes number ten in the strongest ever tropical cyclones, the other nine being typhoons (tropical cyclones which form in the northwest Pacific Ocean, west of the dateline). The strongest ever typhoon recorded puts Wilma in the shade. 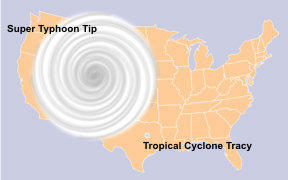 This was denoted a 'super typhoon' and was called Tip. It's winds went over 300 km/h and as an illustration of its scale, below indicates how large it was compared to North America. Tracy was the smallest ever storm to get to tropical cyclone status. Apart from reading more about tropical cyclones, I've been continuing to feel sorry for myself as I'm still full of cold. Horrible tasting Chinese remedies seem to be working, though I've become somewhat wary of the one that I was taking for some time (cordyceps sinensis or caterpillar fungus). It's the supplement which is credited with giving the Chinese competitors some of their best results ever at the Sydney olympics. 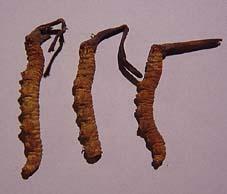 However, the medicine comes from a fungus that grows on a caterpillar which is found only in certain mountainous regions in Tibet. Since its popularity has soared, these mountainous regions have been overrun by businesses trying to jump on the bandwagon and the countryside is being devastated. There are other ways of making the drug including culturing it artificially, however, the most popular form still comes direct from the original source. As far as I know, full scale clinical trials have not been performed yet but it'll be interesting to see where all the hype goes over the next few years. (there is this Chinese study but I don't know how respected it is). Last but by no means least....I've recently been in contact with a Japanese guy who I was room sharing with in Boulder at the conference this summer. He's one of the hardest working people I've ever met and is working on some really interesting things to do with studying phase transitions in quantum field theories using the gauge-gravity duality...great stuff. Anyway, he's also a very good photographer, I've added a link to his site on the left (Daisuke Yomada) where he has some of the photos he took while driving the huge distance between Washington and Colorado. Definitely worth checking out.